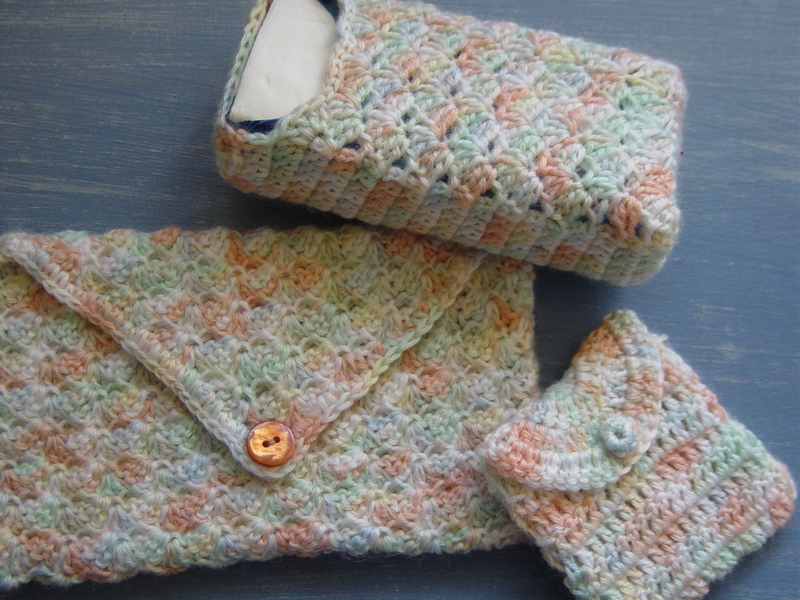 This set began with a shell pouch I made for my mum to say thank you for teaching me how to crochet. Now the set has grown to include more purses! This is my post for this week's Transformation Thursday which is hosted by The Shabby Chic Cottage. 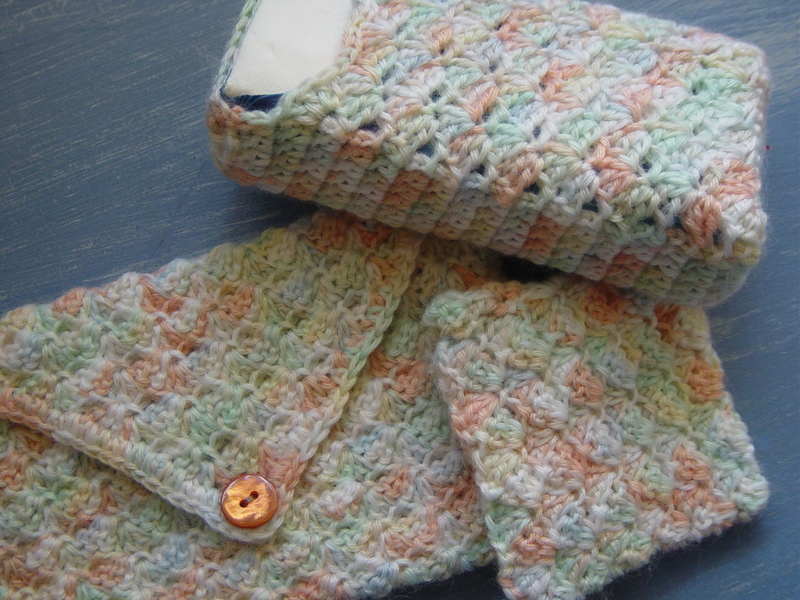 I transformed a ball of lovely and soft multi-coloured wool into these purses. I made the tiny purse without a pattern. I again used the shell pattern for one side then plain for the other so the shape would not turn out wonky. I then made a lid for the purse. I was inspired by the lid on the quick clutch at Crochet Spot but I did not follow the pattern. If I did I probably would not have had to pull it apart two times before I got it right on the third try! I also made up my own tiny button, although I might replace it with a proper button if this doesn't work out. This tiny purse took one morning to do. I completed the tissues cover over two days without using a pattern. I had been planning to make one with a slit down the middle but then I saw the tissues I had bought for this opened a different way. I made this tissue purse using the shell stitch on the front only and plain treble crochet on the back and sides so it would keep it's shape. I had trouble deciding if I would make a lid for it, but settled on leaving it open because the shell stitch made a nice wavy edge. 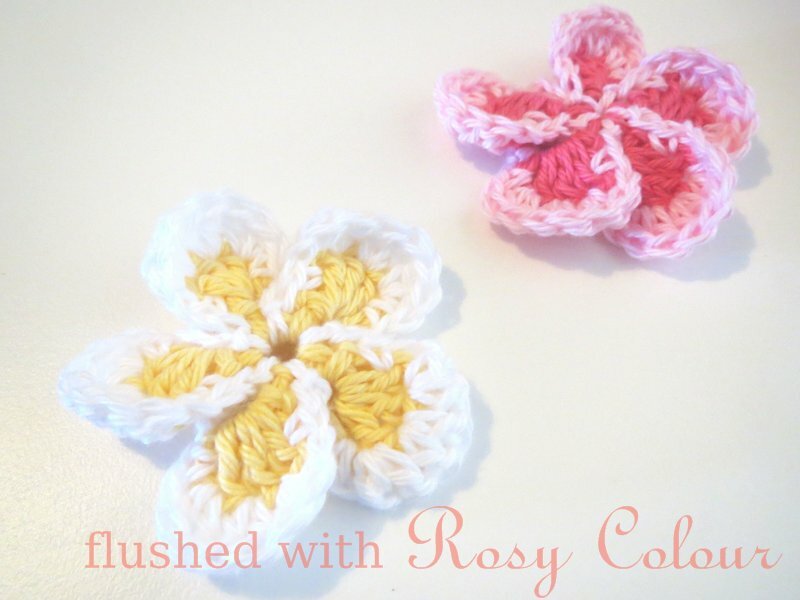 I gave these and the matching tiny dancing teddy bears to my mum yesterday when she came to visit. She said she likes the set, and promptly put her pens in the larger pouch to stop them from rolling around in her bag! The tiny teddies fit neatly inside the tiny purse, they were so cute! Be sure to check out the other things linked in with Transformation Thursday, there is always HEAPS of handy home-crafting ideas which I love to check out! These are just so pretty! They look so delicate and dainty. A great gift for moms and girls of all ages I think! Now this is something I have never learned to do. My grandma tried to teach me when I was very young but I don't think my heart was in it then. Too bad, it really is a great skill. The bags look great. Thank you for stopping by my studio. This is Kathryn from I Can Find The Time and I just want to say thank you for linking to my tutorial on how to turn a t-shirt into a girls dress!